Chickpeas again! 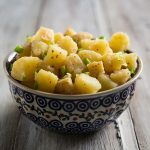 I apologize to any chickpea haters for following one chickpea recipe with another, but in my opinion, there are few foods in the vegan diet as versatile as the chickpea. Think about it: You can smash them, roast them, stew them, and make endless varieties of salad with them; they’re used in cuisines all around the globe, ranging from India to Italy to North Africa to the Middle East, their mild flavor accommodating just about any seasoning you can throw at them; and the chickpea’s firm texture holds its own when other legumes would break down or become mushy. 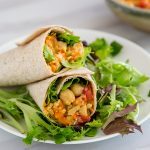 Freshly cooked from dried, they are delicious even unseasoned, but of all canned beans, canned chickpeas are probably the best-tasting, making them perfect for those days when you don’t have a lot of time to get dinner on the table. Over the weekend, I had one of those days. I’d spent too long outside enjoying the Spring weather, and my family was away so I was cooking for one. I had a cup of cooked quinoa in the fridge and a craving for something curry-flavored. I wasn’t cooking to impress anybody, didn’t need an “authentic” recipe (whatever that means)–all I needed was to satisfy my own taste, fast. So I threw together this curried chickpeas sandwich filling from 8 pantry and refrigerator staples (plus the aforementioned quinoa). What it lacks in imagination, it more than makes up in flavor, thanks to my favorite curry powder, Maharajah (available at spice stores such as The Spice House and Penzey’s). 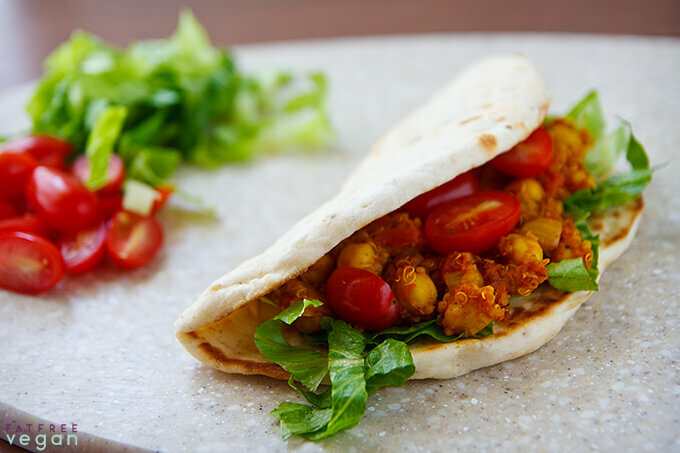 And like the chickpea itself, this recipe is versatile. 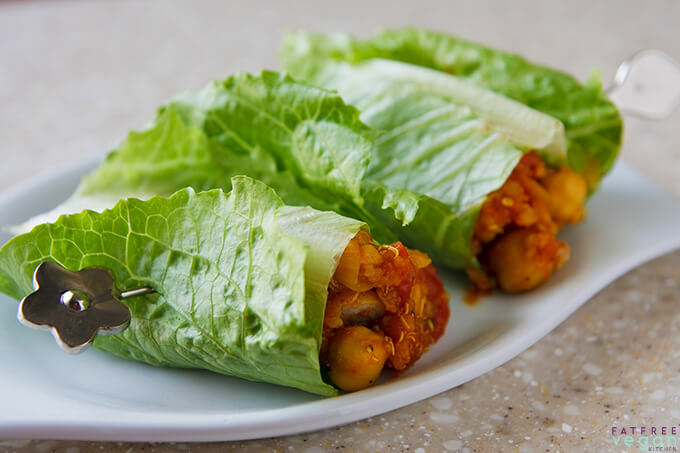 I prefer it piping hot, wrapped in naan or pita bread, but it’s also tasty cold, cradled in romaine or Boston lettuce leaves or just served atop a crisp, green salad. 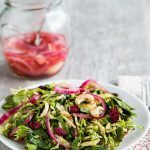 If you like meals that come together in a flash, be sure to check out all of my Ridiculously Easy recipes. A high-quality curry powder is essential here because we’re relying on it for most of the seasoning. My favorite is Maharajah blend, which is fresh and flavorful but not hot. If you use a mild curry powder such as Maharajah, you can add as little or as much red pepper as you like to adjust the heat. Add the chickpeas, curry powder, and red pepper, and stir briefly. Add the tomatoes and cooked quinoa, reduce heat to low, and cover. Simmer for about 10 minutes to allow flavors to blend. Add salt to taste. 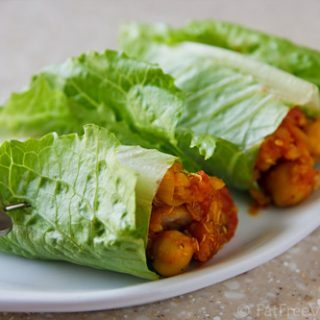 Serve in wraps, pita bread, or lettuce leaves or with naan or other flatbread. One serving (without bread) is 2 points on Weight Watchers Freestyle program. Just had this for lunch wrapped in tortillas and it was good, but I felt like it needed something else in the wrap for a contrasting flavor. Probably just lettuce and sliced avocado would have been good. I liked that this was easy, but I think I will play with the flavors a bit more to change it to my liking. It may have been just OK for me because my curry powder isn’t good enough. When I am back in the US (currently overseas for a year) I will definitely buy the good curry powder and try it again to see if it improves the flavor a lot. I will post my results when I try it again! Hallelujah! Dinner tonight 🙂 I have all these ingredients, and can probably rustle up enough energy to manage this. I have 3 week old baby that makes cooking healthy for everyone else a challenge! This recipe is simple enough that I can probably manage to steam some frozen green beans, too. Ta-da! Very good! I just made this for lunch and even my two year old ate it. We ate it in a pita with lettace. I give it a 4.25 out of 5. Can’t wait to try more of your recipes! Having the Broccoli rice casserole for dinner tonight. I have been vegan for 9 months and now need to be gluten free as well. Thanks for making my life easier! This was so good! Only thing I did different was that I had to use ginger powder (1 tsp. as another comment suggested), and it was still great! Thank you! I just made this for lunch with some naan and it is delicious !!! Loved this recipe, Susan! it is so flexible to make it ridiculously easy… wraps can be a bit finicky, so I chopped up some baby bok choy to add to the curry instead (it was a bit soupy since I didn’t drain the tomatoes). Kidney beans also worked really well. Thanks for sharing such a great recipe! The curry powder I use is a deep golden color. The kind I recommend is from The Spice House or other spice companies. Their spices are much better than wht you’ll find in gricery stores. The tomatoes are undrained. We made these for the first time for supper last night and love them! We had them in brown rice tortillas with a little hot sauce and avocado. Delicious! This morning I ate the little bit that was left over (it was excellent the next day) and added a couple of sliced olives. This will be yet another frequent meal for us, and it definitely is easy! Thank you so much for this recipe. I just made it and I’m going to stick it in the fridge for tonight 🙂 It tastes great! A little spicy, but it’s still good. I should have added less half a teaspoon to start with! Oh well, still delicious. Not to mention, it’s a beautiful dish. I just love those colors. 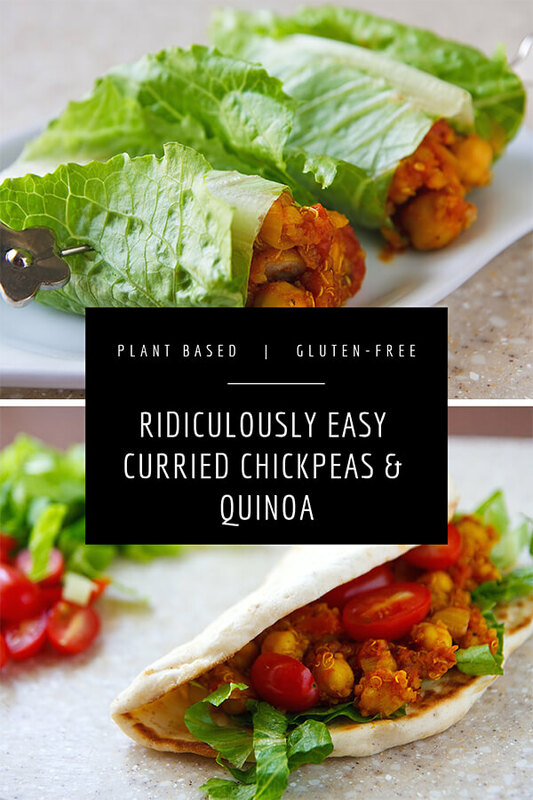 Also, I really enjoyed this recipe…obviously 😉 I added some cabbage as well, and skipped the wrap part and just ate it with a spoon! just got home from a 10hr motorbike ride, and don’t have the energy to go get groceries! 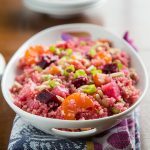 thankfully I stumbled across this recipe – so easy, so delicious, and all the ingredients were already in the house! thank you! I’ve been making this recipe for years, it’s a staple in our household. Is it possible to freeze this meal? We always have plenty of leftovers and it would be a great to warm up this tasty dish at the drop of a hat. Thanks! Sure! It should freeze fine. I’m happy to hear you enjoy it. Hi. I do not have fresh ginger but I have dry ground ginger. How much should I add? I would try 1/2 teaspoon. My husband and I made this the other night. I used sprouted tri-colored rice instead of quinoa. I used Penzeys Curry , The now curry. Its pretty spicy so I omitted the cayenne pepper. I took Fiona advice and put some sliced avocado and toped it off with vegan sriracha aioli on a grilled whole wheat tortillas. It was fabulous! I will be adding this to my favorite recipes.